Giving birth is probably the scariest thing a woman could ever face in her whole life. The pain of giving birth is insurmountable and something you should be prepared for. Of course, no amount of detailed planning could ever prepare you for the joys and pains of motherhood, but there's nothing wrong if you try. Note: This is focused on a Philippine setting. Is doctor accredited with your health care insurance? If you have a personal health care insurance other than the government-mandated PhilHealth, it's important to ask if your doctor is accredited. This could help you save tons of money, and could help you decide whether you want to switch to a doctor who's accredited (though this should be something you need to carefully consider especially if you have a high-risk pregnancy). What hospitals is doctor accredited? If the doctor is indeed accredited with your insurance, you need to know which hospitals she's accredited to practice. Health insurance have two levels of accreditation: one for the doctor and one for the healthcare facility. How much is her professional fee? And how much does your insurance cover? Depending on your health care plan, the coverage of doctors' fees vary. Typically, the lower the plan, the lower the coverage of the PF, and you would need to shoulder the rest of the fee. Are you a candidate for normal delivery? For cesarean delivery? The type of delivery obviously affects how much it costs to give birth. Ask your options whether you're safe to give birth normally, or if your condition (and the baby's positioning) calls for a cesarean delivery. If for normal delivery, can husband go inside the delivery room? Most hospitals in the Philippines do not allow husbands to go inside the delivery room, but it's still worth a shot to ask. Chong Hua Hospital in Cebu, in particular, gives a nod to allowing husbands in the delivery room, given that they have attended a birthing class. 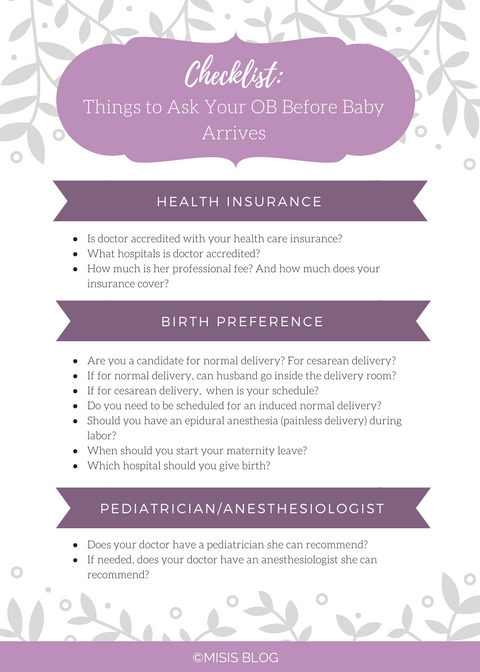 If for cesarean delivery, when is your schedule? If your condition calls for an elective cesarean delivery, be sure to ask when your schedule is. This helps you determine the start of your maternity leave, and a better way for you to prepare for birth. Do you need to be scheduled for an induced normal delivery? Some factors come into play when a doctor advises for an induced normal delivery. It could be that the doctor has a scheduled out-of-the-country trip during the week of your delivery, among many other things. Should you have an epidural anesthesia (painless delivery) during labor? Epidural anesthesia is optional, so this is mainly a personal decision. Most health insurance companies do not cover this, so be sure to ask your doctor how much an epidural will cost if you ever do decide to have one. When should you start your maternity leave? Depending on how far along you are, the condition of your baby, your dilation and effacement, your doctor can give you a rough estimate on when you're most likely to give birth. Discuss your options whether you need to start your maternity leave a few days before you give birth, or if you can wait it out until true labor ensues. Which hospital should you give birth? Factors like the health insurance accreditation of your doctor and the distance from your home or office are important to consider when deciding where to give birth. In the end, it's still your personal choice, but your doctor could still give you advice. Does your doctor have a pediatrician she can recommend? While the choice of the pediatrician for your newborn baby highly depends on you, if you're a first-time mom, you can ask your doctor if she has a pediatrician she can recommend. Other things to consider is whether the pediatrician is also accredited with your health care insurance. 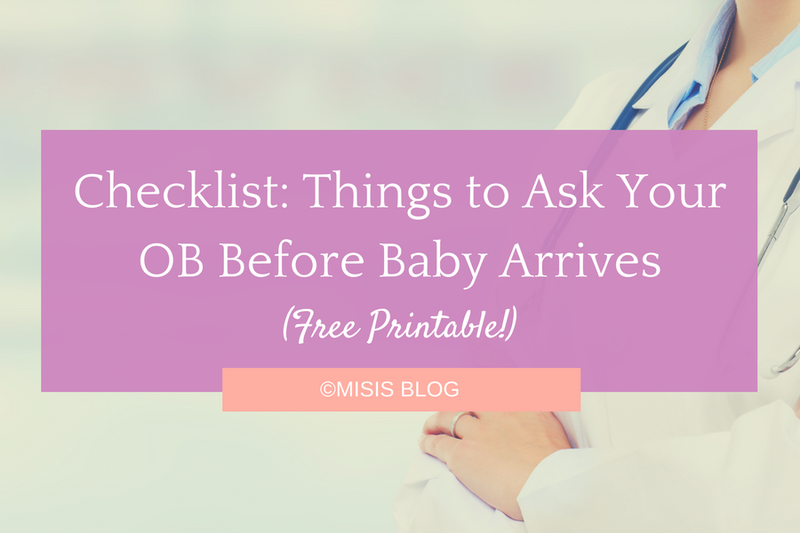 Be sure also to ring your pediatrician weeks before giving birth and ask if the pedia doesn't have out-of-the-country trips within the timeframe of your due date. If needed, does your doctor have an anesthesiologist she can recommend? If you're a candidate for cesarean delivery, or if your opt for an epidural anesthesia, you would need an anesthesiologist. You can choose your own anesthesiologist, or you can ask your doctor if she could recommend one. There are only a handful of anesthesiologist who are accredited with health care insurance companies, so be sure to research on that too.